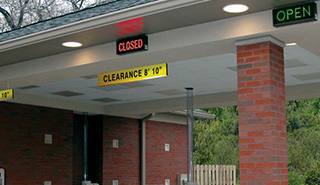 LED bank drive thru signs or lane lights direct traffic to the next available teller or ATM machine. Outdoor LED lighted open closed and ATM signs are the ideal products to use when directing motorists to the next available drive through lane. Our LED signs are virtually maintenance free and can be viewed when the sun is shining directly at them. 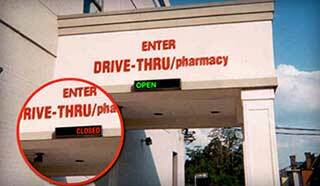 Light the way to your pharmacy drive-thru lane with an energy efficient LED lighted sign. Our LED illuminated signs will save you money over the life of the product. 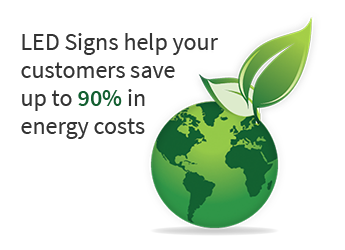 90% more energy efficient than incandescent signs and there are no bulbs to purchase or change. Our LED signs are virtually maintenance free and can be viewed in direct sunlight. Contact us today by email or toll-free by phone 877-547-9900 to request a quote or ask a question. As a reminder, you can view pricing anytime by logging into your account. Not a member? Register today!